﻿If you have been following along then you read about our four hour trip to buy this vanity. I have finally finished painting it to match the other bedroom furniture. Remember what it looked like last week? Her finish was a little beat up but the cane was in excellent condition. So here she is now…. Now I have somewhere to display my sterling vanity pieces and the vanity has a new home in the sitting room off of the master bedroom. The carpet is a light cream even though this pictures make it look pink! This is the bed that started the whole thing. We bought the bed new in this finish and then I matched paint for the armoire and now the vanity. The armoire was also purchased at auction and was originally painted black. We have two matching Pierre Deux chest (one seen in the above photo) that also came from a auction. Can you tell I love the deals you can find at auctions? Sorry about the quality of photos. My camera is going to the shop next week to see what is going on. 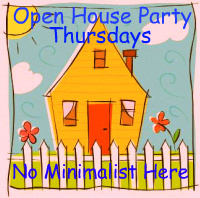 Don’t forget the Open House party that starts Wednesday evening. the vanity looks so much better and perfect for your room. What a deal. I used to sell some very simular from a company in Atlanta and I pd. wholesale $450.00 and so for $900.00. The company was called Olde World design. I think you did good. Love the cane back.Richard from My Old Historic House. Sherry that vanity is jaw dropping gorgeous and that bed makes me swoon. All of the furniture is beautiful… love it all! How pretty…love her style!! Also love the new header…I see several things in the pic on the left that I have here at Coastal Charm. Lovely…just lovely. The pieces all blend and comliment each other so nicely. It looks great, Sherry! That is a really nice color, too. The glass on the surface is a good idea; easier for cleaning. Ok…I'm in love. That piece was beautiful when you got it Sherry and now with its new look its stunning. Your bedroom is past magazine quality with this new addition. 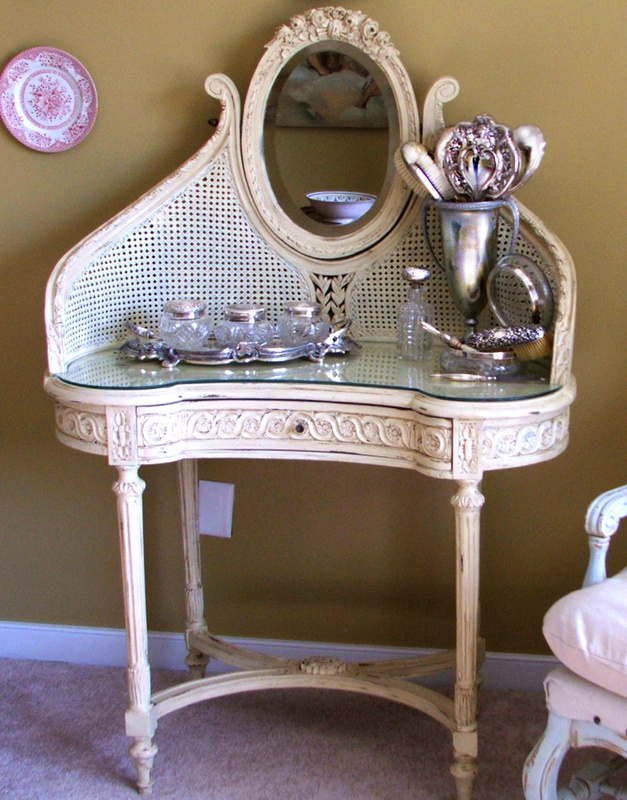 Ohhh my goodness, Sherry…your french caned vanity turned out just gorgeous! The creamy, distressed finish is perfect…I love it! Ohhh…I'm swooning for sure! I still can't believe your good fortune in finding this piece…especially since it goes with your bed so well! My friend, you really do have some of the most beautiful pieces of furniture that I've ever seen! 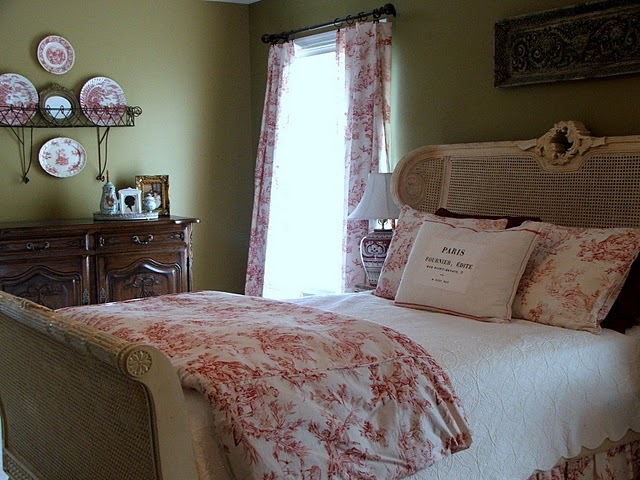 Your bedroom is french perfection!!! 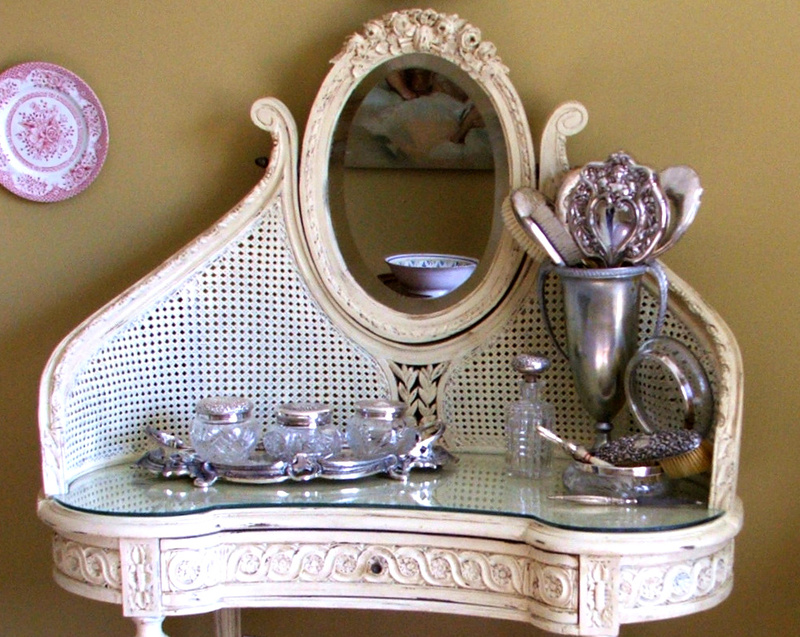 Still tickled pink for you, dear friend…that you found this fabulous french vanity!!! Thanks for sharing your pretties with us…ahhhhh!!! Best wishes for a Happy 4th of July to you and your family, dear friend! I had seen your post about purchasing the darling little vanity and have been watching for the completion. MAGNIFICENT!! perfect for your bedroom, and you'll never forget that day at the auction. Your vanity looks just gorgeous!! I love all your silver pieces. What a pretty vanity Sherry. Loving the new blog header too~ Happy 4th to you and your family. AMAZING, it looks like it came with the bed! Just love it!! Sherry, I love it. I still want your bed! It is gorgeous. It is absolutely perfect with your bed. Love it!! HI Sherry! Oh, your piece is gorgeous and what a beautiful job you did, too! I love your pretty bed! What a fabulous job you did on this vanity – love the cane. Your bedroom is stunning. 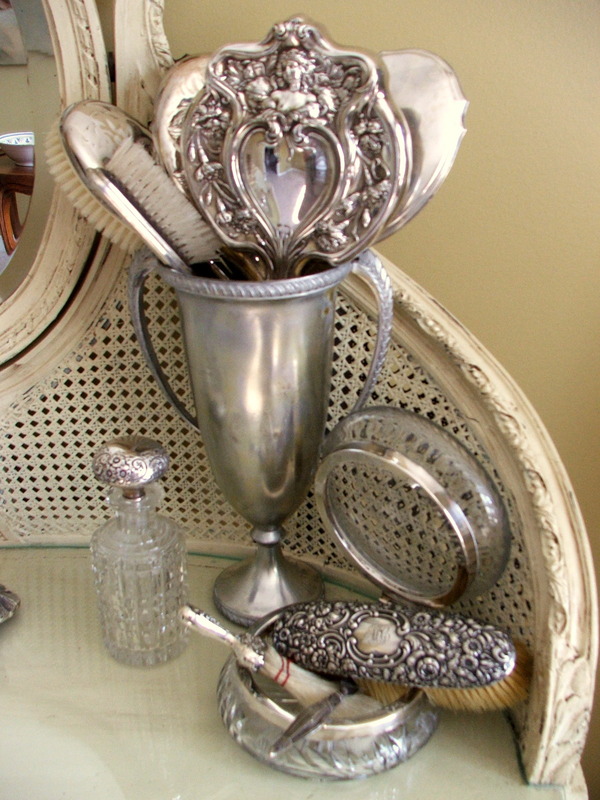 I love the transformation and your collection of vintage silver pieces are divine!! What a deal to get that gorgeous piece for $65!!!! It just has so much charm and is different from any piece I have ever seen. You did a great job on painting it and then decorating it with your silver. Is there a certain type paint that you used on it? I love your whole master bedroom. Hi Sherry! It's a fabulous piece and you did a wonderful job of bringing out it's true character. I love it! Have a happy 4th!! That is one very beautiful and unique vanity Sherry! The vanity is just lovely Sherry! Definitely worth any amount of hours to bring her home! You are so lucky to have found so many beautiful pieces. The vanity is splendid. The bed and bedding are dreamy. Sherry, this is great! There is nothing on the planet that makes you feel more girlie than a pretty vanity, and yours is *gorgeous* What a find, and what a transformation. Holy moly! That's adorable!! What afabulous find, it looks really old. Great finish. Perfect Sherry! It looked before, but it looks fabulous now. All of the furniture is so pretty. That vanity turned out PERFECT! What a great find for your bedroom! No question, the white painted finish is a huge improvement! Vanity is very very pretty. Looks great with the bed. It turned out fabulous Sherry!! Love the vanity before and after. What beautiful pieces you have! You did an awesome transformation on the vanity!! 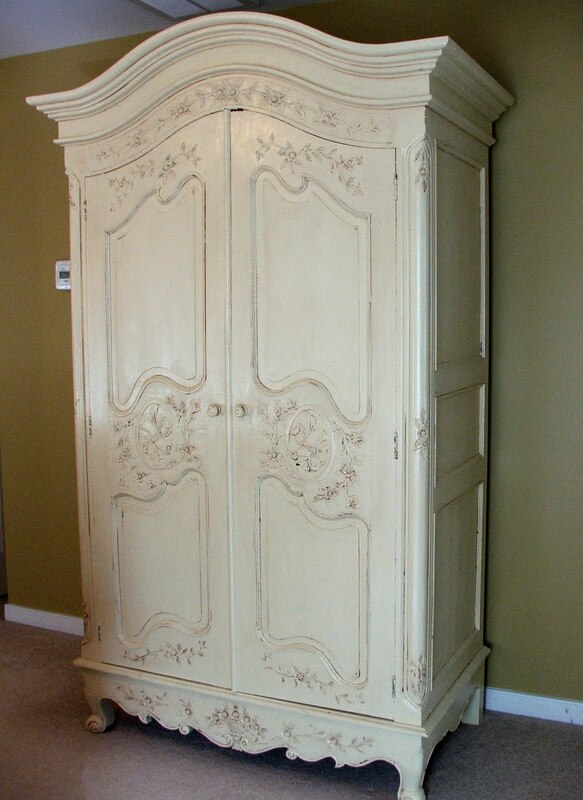 Your armoire is so pretty! The vanity matches the look perfectly! It was so worth the long drive. Such an amazing transformation…I love it! You have beautiful furniture. That vanity is so gorgeous! I love all of the beautiful pieces! The vanity is beautiful and well worth the four hour trip! The armoire is stunning too! That vanity has such great bones and your transformation is beautiful … I love it! Perfect fit for the bed! Sherry, the vanity looks fantastic! The paint really brings out the lovely details. Just perfect! Saw you at Marty's Party. Classy and elegant..are the words! The vanity looks gorgeous! You did a great job! The paint looks fantastic here. Thanks for sharing:) I love all your projects! Can I move in your room?? 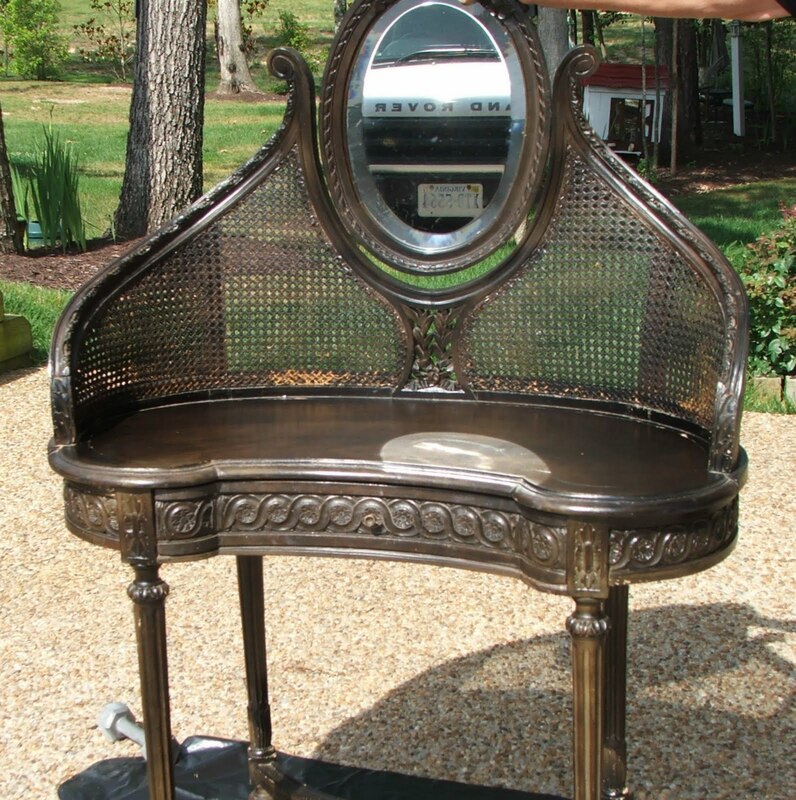 I love the vanity and have never seen anything like it. I also would DIE to have your bed. Gorgous! Thanks for sharing! FA-BUE-LUS, Sherry !! You must be so pleased … I know I would be. Your vanity turned out beautifully … it was "meant" to be this color. And, your silver pieces are perfect on it, as well !! Well, well done !! So pretty! Love your treasures. Wow! It turned out so cute and goes with your bedroom so well! This is one of the most beautiful vanity's ever! Gorgeous! Sherry that is a beautiful vanity. Your finish is perfect! What a perfect blend of furniture. Your room is gorgeous. what a transformation!! that looks incredible! I would so love it if you linked this up to my blog party from trash to treasure. You had me a vanity, I'm doing one right now for my new master bath remodel…oh I love everything French too and this blog is perfect for my fetish..hello new best *friend*!!!! Oh my goodness, those pieces are absolutely stunning. I love them both, they're so beautiful. Your vanity is wonderful and I can see why you drove 4 hours go pick it up! Your whole bedroom is so pretty. I just found you, thanks to Miss Mustard Seed! You're on a roll, it appears, having fun! Beautiful things! I saw this on Ms. Mustard Seed and I'm in love! GREAT job! Gorgeous….it turned out great and goes great with your other Bedroom furniture. Hey, Sherry! I have never seen a vanity quite like this one. What a gorgeous piece. Once I saw your headboard I understood why you'd drive four hours to pick this beauty up! You did an amazing job on the refinishing. Your bedroom is beautiful! WOW!!!!!!! I love it. It's a show stopper now.